A development of six apartment blocks by developer St James and designed by architects Rogers Stirk Harbour, with riverside views. Pavilions one and two feature enclosed balconies, with full height Fieger louvre windows to extend seasonal enjoyment . MESSINGHAM, England - July 28, 2016 - PRLog -- Nine Elms, soon to be the home of the new American Embassy and adjoining a revitalised Battersea, is leading the regeneration of the south bank. Riverlight, a development of six apartment blocks by developer St James and designed by architects Rogers Stirk Harbour, offers spectacular riverside views. Pavilions one and two feature enclosed balconies, with full height Fieger louvre windows to extend seasonal enjoyment of the balcony space, updating the winter garden concept to meet 21st Century expectations. Riverlight comprises six blocks that combine residential accommodation with a mix of shops, restaurants and leisure facilities at ground level to create a vibrant community. The rising blocks are angled to the Thames so that each residence has a river view that is enhanced by a combination of hard and soft landscaping between the blocks. To further enhance enjoyment of these views, each apartment has a balcony. In buildings one and two, these are enclosed to insulate against city noise. This intermediate space, protected from the extremes of weather, can be enjoyed for longer throughout the year and provides spectacular views down the Thames. 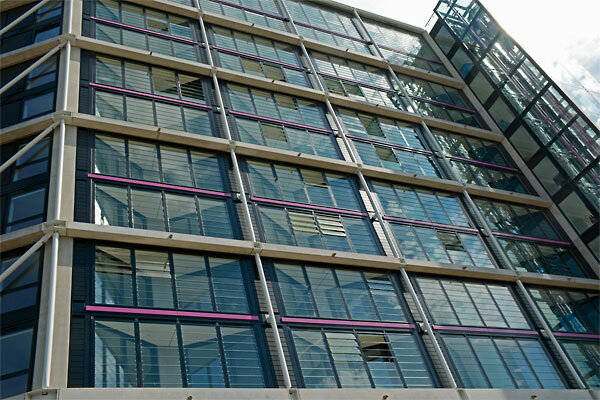 Glazed louvre windows fitted to the balconies form an integral element of the glazed facade. Fabricated by Fieger, the German glass window louvre specialist, the single glazed laminated glass louvres give an open view. They can be opened for cooling airflow in the summer or fully closed to exclude urban noise and extreme weather. Thermal efficiency of the apartments is enhanced by the additional insulation provided by the sealed balcony airspace. Installation of the external louvres was undertaken by ventilation contractor Adexsi UK into a facade supplied by Alumet Systems. Each of the 400 Fieger FLM louvre panels installed has 1276mm laminated safety glass blades built into a matt black finished aluminium frame to match other elements of the facade. Approved Document K of the Building Regulations required the bottom louvres to be fixed and limited for those above up to a height of 1100 mm to be restricted to an aperture of 100mm opening. Louvres above 1100mm are able to be rotated up to 85 degrees for increased ventilation. Individual manual control of each louvre bank gives occupants maximum flexibility. Fieger, who specialise in glazed window louvres offer a wide choice of glazing, finish and control options to suit the needs of any project. Single glazed units are typically used for winter gardens or to partition internal spaces. Where the louvre window forms an external glazing element in the building perimeter, double glazed units are employed to meet Building Regulations requirements. For eco-buildings, that are designed to minimise the need for heating, triple glazed units can be installed to keep heat loss to an absolute minimum. All Fieger products are tested to simulate high wind pressure common in high rise buildings and certified to achieve negligible air infiltration. Fieger also provide an elegant answer to the needs for smoke ventilation in stairwells and circulation spaces in multi-storey apartments and workplaces. These systems provide natural daylight and can be integrated with smoke detection or the building management system to open automatically in the event of an incident. The company work closely with architects, engineers, contractors and building owners to provide bespoke products to meet ventilation and natural lighting challenges.